Indicate your responses to statements and questions based on this flight such as "Were we on the look out for your comfort?" etc. 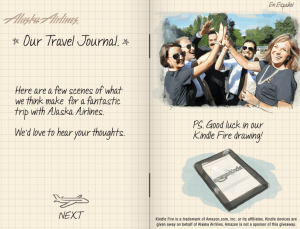 Are you one of Alaska Airlines Mileage Plan members? If you travel a lot with Alaska Airlines and could use a customer loyalty program, join their Mileage Plan and earn miles and segments towards Elite Qualification on flights taken with Alaska Airlines and all 12 of their global airline partners. For corporate travel, EasyBiz helps you earn flight miles along with 24 hour reservation holds, travel management tools and ticket reports ans a price guarantee. More benefits are available to access for Club 49 members. Alaska Airlines is the 7th largest US airline in passenger traffic but it is not part of any of the 3 major airline alliances. The airline has won many awards and the Alaska Air Cargo has the most extensive air cargo operations on the west coast of the U.S. I would like Alaska Airlines to know that their employee David Joyner (Seattle air port) customer service on Christmas Day that he was a blessing. After spending 4 hours in Yakima and 1/2 hour on the tarmac (YKM.) PNR Code UPIBF2 YKM 2201. We missed our connecting flight by a minute - six of us. After explaining my day gave my family a food credit. He listen had compassion and did what he could to make a long day a little more bearable. He was gracious and very helpful. On our flight to palm spring in oct. was super on time not a problem that why most of my flights are Alaska, super job on the crew. Just a note about Joe Ellis. 78 years young, energetic, obviously loves his job and is great at it. He should be teaching everyone else how to do that job. He is the best that I've seen in flight attendance. Just a joy to have in the first class cabin. I wish him every success. I would just like to thank Tammy in Phoenix reservations for her wonderful and most helpful assistance! She was very patient and walked me through a new reservation and a refund. Not once did she say I had to do it all on line! She just stayed with me until it was done. In today's world of all automation, it was just lovely to have a human touch over the phone. Thank you Alaska Res, and thank you Tammy!! I enjoyed my flight so much on 4-26-15 coming from Anchorage, Seattle, Orlando. Flight number 10 was great. The employee Siegfried Krebs was extremely kind, entertaining and friendly. I requested his name, as to compliment him. I have never experienced a bad flight on Alaska Airlines. I am not a big jet setter (which I would like to be) but always do my best to go with Alaska. Thank you for the mileage plan opportunities also. My Best Always to your company. I traveled on 4-19-15 from Portland to Boise. My two (2) flight attendants were Trudy & Terry. They were amazing, they catered to my every needs, very friendly and professional. The next time i fly Alaskan Airlines again I hope those two woman are my FA 's. Overall, how well did our flight crew create a warm, friendly, and caring environment for your trip, with a smile? Rating was not filled out. So everything with Alaska Airlines was good except your survey... go figure. I am a frequent traveler on Alaska Airlines, a thousand miler working on the second thousand. Needless to say, I am an enthusiastic supporter. Unfortunately, I recently had a very bad experience with the airline. I made plans to travel with my son and meet my daughter from the UK in New York to take part in the Explorers Club special weekend. I bought a round trip first class ticket for myself to fly from Fairbanks via Seattle to Newark, and a first class ticket from Anchorage to Newark via Seattle using miles for my son. We met in Seattle on the evening of March 19th, stayed the night, and planned to take the morning flight to Newark (Alaska 8) on the 20th. After several delays, the flight was cancelled. We found this out on TripIt. The Board room staff recommended that we go out of security to a first class counter and get help. Which we did. After much difficulty and heroic effort she got me an all-night itinerary through Dallas/Ft. Worth to Newark. That got me there a few hours before the dinner on Saturday night. She couldn’t find anything for my son. Everything was booked up on all airlines. We spent hours with the gold reservations and gold partner reservations that afternoon, but they gave up in the end. My son had to stay in Seattle over the weekend and catch his return flight to Anchorage on Monday. In addition to his missing the weekend in New York, I was stuck with a $700 banquet ticket and his no-show hotel room. Also, I was charged 60,000 Alaska Airlines miles for his non-flight. The Alaska Airlines staff tried their best, as did the gold reservations and partner reservations. However, in the past, Alaska Airlines has rebooked me immediately after a flight cancellation. I am, and wish to remain, used to better service. I realize that the reason given for cancellation was weather (snow in New York.) Actually, there was no snow in New York. I had the worst experience with alaska airlines on february the 3rd after more then 10 hours flight and 8 hours layover in L.A our flight got delayed from 8pm to 12am.we had to borad the flight twice and were told to get off again for reasons unknown to us.our flight landed in vancouver at 3.30 am and i reached my parents house at 5am and since i had a connecting flight to edmonton where i live i had to rebook it.i went through so much trouble for one day and after all this i wont be flying alaska anymore. I have been flying Alaska Air now for 3 years now from Boise to Alaska every month, I'm tall and broad shoulders I always get and isle seat, my last trip home seat was changed on me to middle seat. I do not like the middle seat, my ride was very uncomfortable, with two bigger people beside me, my return trip was also changed, the agent at the terminal fixed it for me, thank god there was I isle seat left in the back of the plane, I always sit up front very seldom do I get the rear of the plane. my complaint is once I make reservations for a trip and get an isle seat, do not change it on me, I know of a few fellow co-workers who quit Alaska for the same reason. I writing this letter so we don't have the problem in the future. I flew from San Diego to Seattle on July 11, 2014 on flight 493. I can't say enough about the great stewardess, they were kind, thoughtful and efficient.Their names are Cheryl, Robrt and Warkeu Sue. As always our travel with Alaska Airlines and Horizan are great experiences because of your sensitive and caring personnel. I just returned from a mostly wonderful trip to Mexico. I was mostly satisfied with Alaska Airlines this trip with one exception. This being my first trip to Mexico I was not sure what to expect to get thru customs so a 5 hour layover did not seem like a bad idea when we booked our tickets. We arrived to LAX and got thru customs in about 30 minutes. I went to the Alaska airlines ticket counter and asked if there was an earlier flight to Seattle with available seating. She did look and said there were plenty of seats and for a $25 per ticket I could change my ticket. I declined and she informed me, that if I change my mind, I could still change at the Gate service desk. My wife and I decided to go find something to eat and get thru security. While eating my wife asked me about our discount vouchers that we received last July, the voucher was for a flight last summer, when my family was stuck at the Bellingham, WA. for several hours, because the Alaska jet to Honolulu, HI broke and was grounded until they fixed it. This seemed like a logical thing to me that our vouchers could be used for this. I have an Alaska Airlines credit card and it was cheaper for me to pay full price and use the companion fair than this voucher, I received. So the chance I will actually use this voucher before it expires is slim. This idea that Alaska Airlines, can delay my flight for several hours. Then Alaska Airlines feels like they have adequately compensate me, by sending me a voucher that expires in July, that I most likely will not have the opportunity to use. Now I plan on my son using his voucher in June to a trip to Alaska. The rest of my family has no scheduled flights this summer. I am sure I am simplifying this a bit. But the idea that Alaska Airlines could have changed my flight for me at no cost to me or to Alaska Airlines. It would not have cost you anything to have made my last flight change I requested. However by not accommodating my simple request, may have a cost you more than you are aware. I have flown several airlines and the one thing that I always liked about Alaska Airlines was that you were local Seattle area, and you did not seem to be big corporate Airlines. I guess times have changed and I guess, so have you.